You don’t have to dress like a tourist to be one! Dressing for travel is an artform of its own. It’s important to be comfortable, but you also don’t want to attract the attention of pickpockets or thieves. 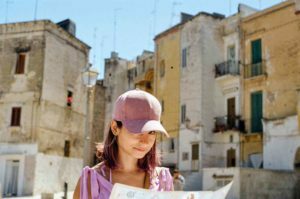 With a bit of planning, even the most inexperienced travelers can explore a new country without looking like a tourist. You’ll want to take beautiful photographs for “The Gram,” but be careful displaying your expensive camera equipment to the world. If you pack a camera, keep it concealed in your purse or small backpack instead of carrying it around your neck. A camera strap might be convenient, but it’s also a beacon for pickpockets. You don’t need to display your love for London on a t-shirt while snapping pictures of Buckingham Palace. If you do purchase clothing with the name of the city or country you visit, leave it in your suitcase until you arrive home. Nothing screams “tourist” more than a brightly colored souvenir shirt. Airports are not immune to fashion faux pas. A money belt might serve as a functional piece of equipment, but many travelers make the mistake of wearing it on the outside of their clothing. Whether you’re going through the security check or waiting at your gate, ensure that your money belt is properly concealed. Unless you’re backpacking through Europe, there’s no reason to carry a large hiking pack around. If you choose to pack a hiking bag rather than a suitcase, bring a smaller backpack or purse with you as well. Leave the large backpack at your hotel for safekeeping, and carry your wallet, camera, and other items in the smaller pack when you explore. This entry was posted on Wednesday, September 19th, 2018	at 1:47 pm	. You can follow any responses to this entry through the RSS 2.0	feed. You can leave a response, or trackback from your own site.